We hope the double-stabilized version (embedded below) doesn’t make you too seasick. You may also enjoy the links below and appended background information re-posted from what was originally published at orcasphere.net. Video credits go to Beam Reach students Brett Becker and Courtney Kneipp. Still photo credits go to the Washington State Department of Ecology and Iris Hesse of the Center for Whale Research. Listen for a very unusual simultaneous call made by many individuals during the last minute of the recording. One of the most remarkable behaviors of the southern residents is the “greeting ceremony” in which two groups of orcas line up facing each other and then mingle together. This article describes a similar “ceremony” acoustically and visually (video; photo gallery), and then discusses whether it may have been related to a “greeting,” a “goodbye,” or a more complex combination of activities. I offer it here in the hope that others who witnessed this particular event may further consider what occurred. Please feel free to comment on this article and/or contribute your thoughts via the discussion forum. Insights from other accounts of different “ceremonies” performed by the southern resident (or other) orcas would also be welcome. Perhaps we will piece together a publishable story? On October 4, 2005, only a week into a month of sailing with the southern residents, students and teachers of the Beam Reach marine science and sustainability school approached San Juan Island along with members of J and L pods. The Beam Reach research vessel, the sailing catamaran Gato Verde, paralleled the orcas as they moved northward from Salmon Bank along the west side of San Juan Island during the mid-afternoon. 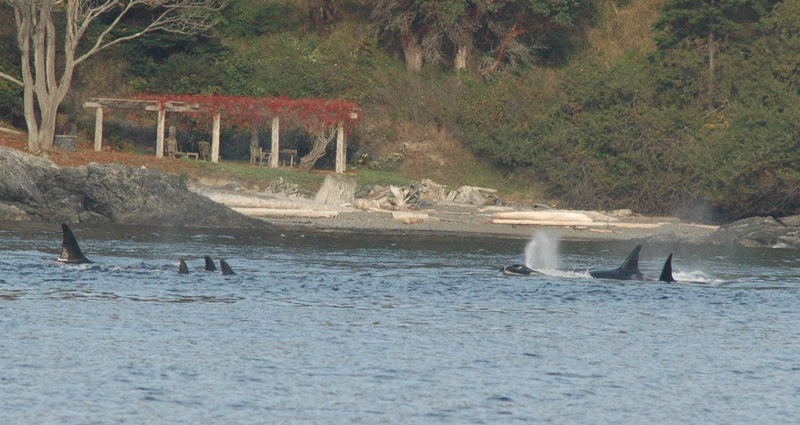 In the early evening, starting around 4:30pm PST, the pods began to concentrate within 100 meters of shore below Hannah Heights. The “ceremony” that we observed (along with Tom McMillen, observers from the Center for Whale Research, and Sharon Grace [and others?]) was similar to “greeting ceremonies” that sometimes occur in the spring as the southern residents return to the Salish Sea from their winter ranges. One group of at least 9 adults and one calf (probably a subset of the group that had been traveling northward with us) congregated within 100 meters of shore ~0.5km southeast of a promontory with abundant driftwood (48o 29.65N, 123o 7.62W). They remained on the surface, gathered into an extremely tight group, traversed the shoreline southward for a few minutes, then doubled back to the north. Meanwhile, a different group of at least 9 adults rounded the driftwood point, heading south, and began to congregate in a rough line just south of the promontory’s rocky bluffs. They, too, remained largely on the surface, drew together in a line, and proceeded slowly southeastward toward the southern group. When they were about 25m apart, the southern group lunged forward, submerged, and quickly met the northern group. The two groups mingled, turning quickly and making brief dives, and remained together for an extended period (at least 15 minutes — we left at ~5:15pm to make port before nightfall — and probably much longer). The ceremony was documented by Beam Reach with still photographs, digital video, and stereo underwater sound recordings. Preliminary analysis of the still photographs and video suggests that at least J40, J14, and L41 were part of the southern group. Tom McMillen of Salish Sea Charters with Iris Hesse and EEH (??) 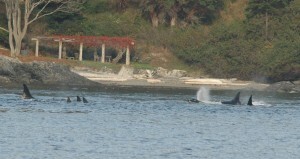 of the Center for Whale Research (CWR) were drifting near the northern group and photo-identified many of its members. Based on an initial examination of still photographs taken of the combined groups, Dave Ellifrit of the CWR noted that L84, L41, L90, L72, L55, L82+calf, L25 with L41, and Raggedy (K40) were present. Any additional photo-identification (and associated) debate is welcome! An interesting aspect of this event, first pondered by Tom McMillen (and later discussed with Ken Balcomb and Dave Ellifrit? ), is that it approximately coincided with the last time that the matriarch L32 was seen. Earlier in the day (about an hour before the ceremony began? ), Tom observed L32 with son L87 and noticed that she was emaciated and had a weaker-than-normal blow. CWR photographs confirm that L32 had a sunken blowhole area (“peanut head”) that day. L32 was not observed after the ceremony and L87 was observed the next day (or maybe 2 days later?) without L32, so L32 is now presumed to be dead. Could we have witnessed a “goodbye” ceremony? Perhaps, but the CWR photographs reveal that the ceremony also involved foraging (birds hovering over orcas at surface) and sexual activity (sea snakes). Beam Reach video shows traveling behavior, milling, tail lobs, and pectoral fin slaps. There was a lot of acoustic activity prior to the meeting of the two groups, including abundant echolocating and intermittent calls, and an amazing coordinated acoustic event in which many individuals call simultaneously (without an obvious cue). Please don’t hesitate to comment, email, or start a discussion thread if you have information or ideas about this fascinating behavior of the southern residents. I was a member of the Fall 2005 class got inspired to write a blog about my experiences since the class while listening to Dave lecture about sound production anatomy in toothed whales shown on the Ustream live video. Since that class, I received a BS, an MS, and am now looking for the right opportunity to begin a career in environmental consulting. Beam Reach solidified and focused my goals as a scientist. During the 10-week program I learned a lot about myself as someone who can work in a team, or individually, as well as gained valuable insight into the world of marine mammal science. I made wonderful professional contacts and amazing friends. In addition, it was one of the highlights of my life. It isn’t too often you get to be so close to such intelligent and unique animals, surrounded by people who are interested in the same things you are. I went home with a new drive and completed a marine biology degree with the intention to some day continue in a graduate program. After graduating with my BS, I continued working on a project for the National Marine Fisheries Service, where I learned something about working for a federal agency who is there to protect mammals using the environmental laws. I was later hired at an environmental consulting firm, where I worked for a few months because I also got accepted into a graduate program. I began at San Diego State University in 2008 working under Ted Cranford, whose work was the subject of part of a lecture Dave Bain gave today. I initially was uncertain how I felt about switching from a strictly ecology background with an interest in bioacoustics to anatomy. But, as it turned out, I really enjoyed it. There was blood, sweat, and tears shed in between the many good times. And I do mean, literally, blood, sweat and tears. I definitely injured myself enough times to learn my lesson around most tools, the porpoises carried onto CT scanner beds were heavy to prepare and maneuver, and sometimes I just sat down to cry out of frustration. I learned that most often things did not go according to plan, but at least the preparations made adjustments much easier. My thesis project was focused on the mandibles of toothed whales because they are an important component not only in feeding, but also sound reception. Using newer methods of analyzing morphology and shape (excluding size), we were hoping to get some insights into the evolution and function of the mandibles. We saw that the posterior region, the region implicated in sound reception appears relatively conserved suggesting that stabilizing selection is acting on that part of the mandibles. Whereas in the anterior portion, thought to be primarily for feeding, there was much more variability among all Odontocetes, or the 53% of described species I used in my study. Using some comparative phylogenetic methods, we were able to confirm that, in fact, stabilizing selection was likely occurring. The results suggested that there is an optimum shape for the posterior region of the mandibles, perhaps an optimum shape required to adequately hear underwater? Grad. school was a pain but well worth it. I learned so much about myself: my strengths, my weaknesses and how to overcome those weaknesses. I worked with Dr. Ted Cranford, who is brilliant and while he expects a lot out of a student, he taught me to become a much better scientist. If anyone is interested in mechanisms of sound reception and production, he is someone with whom to talk. Although I truly enjoy marine mammal work, I am now looking toward a career in environmental consulting. I would love to apply that to marine mammals, but look forward to expanding my knowledge and skills to terrestrial ecosystems. I recently was hired as an on-call biologist for a firm which will provide me with the opportunity to do just that. I look forward to applying the lessons learned during Beam Reach and my other experiences, to which Beam Reach helped open the doors. After several years of “regrouping” (a.k.a. child-rearing) I will finally take the next step toward my academic goal this coming fall. I’m entering the Master’s program in Wildlife and Fisheries Science at Penn State. Thanks to ongoing encouragement from Jason, Scott, Val, and Celia (of course! ), and a lucky posting on MARMAM last spring, I found my advisor, Dr. Jennifer Miksis-Olds, who works jointly with the Graduate Program in Acoustics and the Wildlife and Fisheries department at Penn State. I will be supported through the Applied Research Laboratory at Penn State and am excited to be the first master’s student in Wildlife and Fisheries to receive ARL support (thanks to my acoustics background via BR). I hope to set a good example for that partnership, and also to raise interest in Beam Reach at Penn State. Best wishes to the new Beam Reach spring class of 2009!